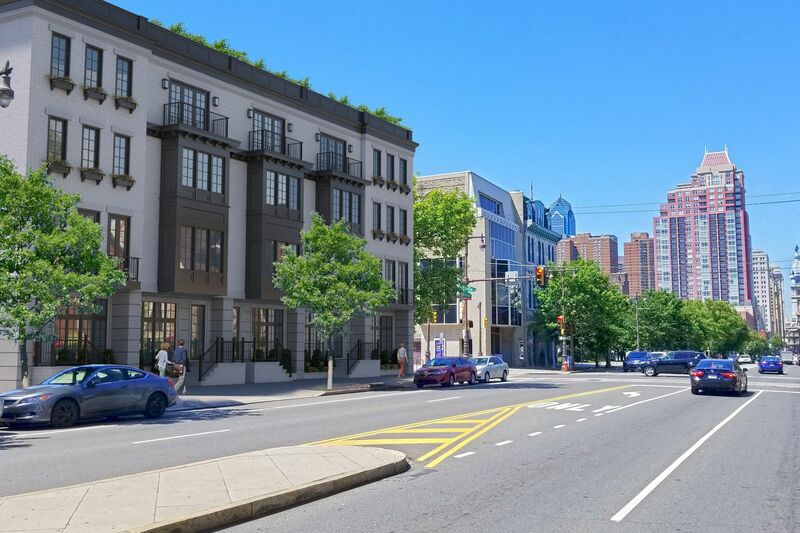 At South Broad and Fitzwater Streets in South Philadelphia, Brooklyn-based Heights Capital Partners is planning to build 10 townhouses this fall, which are expected to cost $2 million each. Brooklyn-based Heights Capital Partners is planning to break ground this fall on a 10-townhouse community at the southwest corner of South Broad and Fitzwater Streets, filling a lot that has long sat vacant. The townhouses, which are expected to range from 4,000 to 5,000 square feet in size and go for around $2 million per unit, are likely to be completed in late summer or early fall of 2019. Five of the townhouses will face Broad Street, while another five will face South Rosewood Street. OCF Realty, founded by developer Ori Feibush, will be the broker for the homes. Heights Capital Partners' South Broad Street project joins a growing list of new developments that have been creeping down Philadelphia's most prominent corridor in recent years. Just a few blocks south, at South Broad Street and Washington Avenue, Alterra Property Group, Kimco Realty, and MIS Capital have begun leasing more than 300 new apartments in a ground-up development called Lincoln Square. The new development also includes ground-floor retail, which will house a Sprouts Farmers Market, a Target, and other commercial tenants. Each of the townhouses will have four-bedrooms, a roof deck, and a garage. Meanwhile, across the street at South Broad and Washington, developer Bart Blatstein last year purchased a four-acre parcel at the intersection for $19.6 million. Hotels and smaller-scale projects, including the five-story affordable senior housing project by Catholic Health Care Services at South Broad and Ellsworth Streets, are also in the works along the corridor. Despite the activity surrounding it, the lot at South Broad and Fitzwater Streets sat fallow for years, attracting interest from developers who floated different townhouse proposals. Ultimately, however, nothing materialized until Heights Capital Partners purchased the property for $4 million in January. According to Ryan Reich, founding partner of Heights Capital Partners, each of the homes will include four bedrooms and a roof deck. Each townhouse will have its own garage, which will be accessible from an entrance along Fitzwater Street. No commercial space will be included. "With how much is coming online along Washington Avenue, the gap between South Street and Washington is going to be a pretty desirable place to live," Reich said. In addition to the group's work along South Broad, Reich said Heights Capital Partners is also planning a 38-unit apartment project at Ridge Avenue and Mount Vernon Street in North Philadelphia, just a few blocks south of Eric Blumenfeld's Divine Lorraine. Between the group's North and South Philadelphia projects, as well as an unnamed potential third, Reich said Heights Capital Partners will likely spend $15 million in cash in Philadelphia within the next few years. Heights Capital Partners is also planning a project at Ridge Avenue and Mount Vernon Street.